In November of 2012 I went to Kauai and the Big Island for the first time, and was promptly bitten by the Hawaii bug. I have been to many beautiful and interesting places, but none have smitten me like Hawaii. No other place made me want to return so bad that it hurt. So when I got a DDMS text one cold and dreary December morning that Delta was having a major pricing glitch, I know exactly where I'm going. After half a nail-biting hour of browsers hanging and Priceline misbehaving, I had my prize in hand: three ticketed reservations, flying JFK-LAX-LIH on 8/10, and returning OGG-HNL-SEA-JFK on the 18th. Total cost? $582.90. Within a few minutes of booking the deal was dead; prices were back up to normal. Of course I know that this being a glitch, it's very likely that the tickets won't be honored. However, after just a few minutes, another text arrived: Delta announced that they're honoring any and all tickets! Thinking this can't get any better, I settled back down to work. But what do you know - another text: the glitch had worked for first class as well! I hadn't even thought of searching for F and J, and now I was kicking myself for it. On a whim, I figured I'd check my tickets again - if Delta was so broken, who knows, maybe they put me in first class too. Sure enough, there it was - all but one leg in either First or Business Elite! The only leg that was not - LAX-LIH - had booked into B class, which would entitle me to free Economy Comfort. Since this was more than six months out, I knew that it’s almost inevitable that there won’t be a schedule change, so I decided to wait for that and change the tickets then. Sure enough, in early March, I got an email that the LAX-LIH flight had been pushed off by two hours. A quick phone call later and I was confirmed on a new itinerary: JFK-LAX-HNL-LIH. This was perfect since I would now be flying to LA lie-flat on the B767 instead of recliners on the B757, but more importantly, I could now drop the HNL-LIH leg and jump on a HNL-OGG plane instead. A week before leaving I suddenly get an email notifying me of a completely new itinerary: JFK-ATL in F on an MD-88 ( ), and ATL-HNL on the A330 in Economy Comfort. The really annoying part was that my original flights were still scheduled as normal - but for some reason they had bumped me off those flights! I called Delta right away and expressed my disappointment on flying 2 hours in "first" and then 9+ hours in economy, vs. 5.5 hours in a lie-flat bed. The rep was extremely helpful (and annoyed at the change as well, since she could not see any reason for it), and asked me how she could make things right. On our return flights we also had a couple of minor schedule changes, which ended up in switching the original OGG-HNL-SEA-JFK to OGG-LAX-JFK. The advantages were a later flight out, so more time in Hawaii, plus lie-flat on the 767 on the LAX-JFK leg. All in all I found Delta absolutely amazing the deal with. From the very beginning when they announced that they're honoring the glitch tickets, through the multitude of schedule changes (there were 11 of them in total, each of which worked to my advantage), to the flights themselves. Pity their FFP is so lousy. Assuming 1.5cpm, total cost p/p: $-254.60. Not a bad deal... Not bad at all. Now can't wait for PICTURES! Thanks for taking the time, I'm looking forward. Looking forward to the continuation, and the pics! Thanks. Can't wait for your professional photos. Pretty amazing that everything worked to your advantage. For this trip we decided to use Pom meals for the first time. We had read plenty of great things about them in other people's trip reports, and figured it'll make a nice change from preparing meals beforehand and/or cooking on vacation. We were also moving 10 days after coming back, so any cost of the meals was absolutely worth it in time not spend shopping and cooking. Since their menu changes often, they sent us the latest menu by email. You simply reply with your choice of main and two sides, and they ship or deliver it. Right away however we started running into problems. We were leaving on vacation the Sunday after Tisha B'av, as was half the Jewish community it seems. This level of demand meant that all orders had to be in earlier that usual. I didn't know this little detail, and placed my order a day after the deadline. To Pom's credit, this earlier deadline was clearly mentioned in their email; for some reason I didn't notice it. I got a call from Pom that day letting me know that even though I missed the deadline, they will still deliver on time, albeit later in the afternoon on Friday. Sure enough, the order showed up as promised, except that it wasn't exactly right. They has mistakenly swapped one of our dishes with one from someone else's order, but more importantly, everything was wrapped for warming in the oven, instead of two being microwave-wrapped. This presented a more serious problem, as we were going to spend the last night in a cottage in Hana with only a microwave. I called Pom, but kept on getting bounced around (this being their craziest Friday of the year and all). It was the eleventh hour and I was getting desperate. After a while I finally got through to the manager (Shimmy, if I remember correctly), who promised that he'll call me back within 15 minutes from somewhere quieter. Yeah, right. At this point I had given up on getting any help. However, a few minutes later my phone rings and he's on the other end. First he tried confirming that everything actually was oven-wrapped (I had never seen the microwave wrapping so I wasn't 100% sure). He gave me his personal cell phone (talk about customer service!) and we switched to texting so that I could send him pictures of the packaging. After some back-and-forth he confirmed that yes, everything is in fact oven-wrapped, and also that it is far too late to do anything about it now. At that point I had what must have been the most backwards customer service argument ever: I said it's okay, I guess we'll manage and figure something out (remember - I had ordered after the deadline and should be grateful that I'm getting anything at all). Shimmy on the other hand was insisting that he refuses to not satisfy a customer 100% percent, and I should give him my address in Hawaii and he'll overnight the missing food. I said that's absurd, he's not spending that money on shipping for two meals. He said I should cut it out and send him my address . By that time is was close to Shabbos so we dropped it for the time being. Throughout the day Sunday, whenever we landed and got cellular service back, there would be a message from Shimmy asking how everything was going and reminding me to end him our address. Eventually he broke us down and we gave in . A day later, a box from Pom far larger than it should have been arrived at our rental. Instead of just resending the one missing dish and two microwavable ones, Shimmy had resent our entire order! We were in awe. Pom had gained a lifetime customer, that much was certain. Taste-wise, we were disappointed though. For example, the General Tso's chicken was just chicken nuggets - not a trace of sauce. Some of the other dishes were just... plain. Some dishes were quite delicious (chicken capons, Swedish meatballs), but I failed to see why everyone here seemed to go crazy for their food. However... Once the second batch arrived I understood. Every single dish, whether a fancy rib steak or simple tzimmes, was absolutely delectable. The General Tso's was saucy, spicy, and delicious. A complete turnaround from batch 1. The explanation I think is obvious - they were simply overwhelmed with the post-Tisha B'av crush. Once they were back to normal operations the food went back to normal too. In the end, I highly recommend them and will definitely be using them again. And I highly commend Shimmy for setting a new standard in customer service - talk about going the extra mile. The flights are all confirmed (for the 11th time), the food is ordered, and we're ready to go. Except that for the only the third time since 1950, a hurricane is headed straight for the Islands. And for the first time in recent history, there are actually two of them. 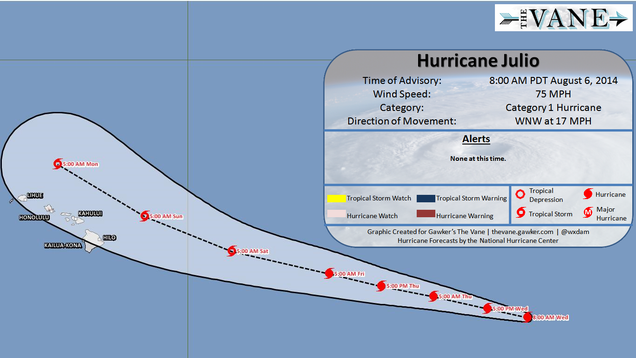 Both Hurricane Iselle and Julio are expected to make landfall on Maui with 75-80mph winds and up to 12 inches of rain. 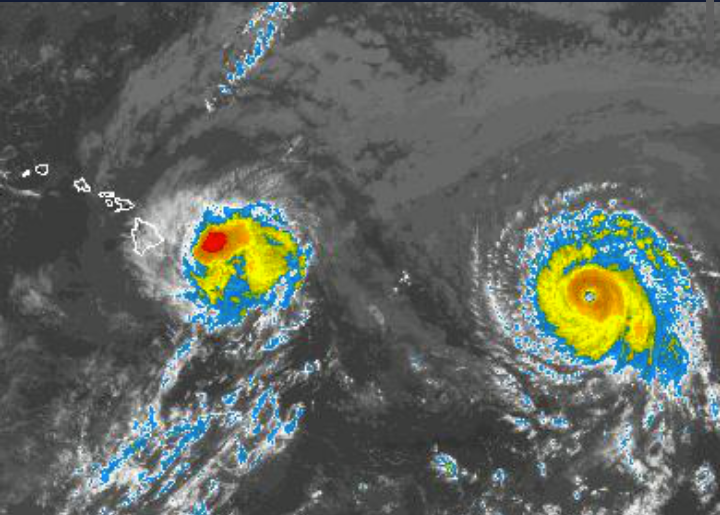 Iselle is expected the day before we arrive, and Julio the day after. Airlines (including Dleta) had started canceling flights to the Islands; Hawaiian canceled all inter-island ones. The Big Island and Maui were expected to be hit the worst; schools and businesses closed, long gas lines formed, and Costco was cleand out of bottled water. Even if the hurricanes didn't hit while I was there, there was sure to be blocked roads, closed beaches, and a whole host of other problems. In fact, a rainstorm earlier in the year had closed the Road to Hana for over a week. We were seriously considering canceling or postponing our trip. However, since we were moving right when we came back this wasn't really a very realistic option. I started obsessively following the local weather news; there were a number of websites and Facebook pages which had up to the minute on-the-ground information. Sure enough, right on schedule, Iselle roared onto the Big Island, causing a tremendous amount of damage. However, wonder of wonders, other that some moderate rainfall, Maui was not hit at all. The worst of the damage was a fallen tree blocking a road; the hurricane had fizzled over the BI. However, the danger was not over - Julio was barreling towards Maui and growing stronger. By Friday afternoon we were still not 100% sure if we're going or not. The second I got home from Maariv on Motzei Shabbos I jumped onto the computer and checked my flights. Not canceled - that's a good sign. I then went to check Julio's path. Unbelievable! In maybe a 1-in-100 freak occurrence, it had veered north right before the islands and was now tracking a hundred miles away from Hawaii and getting further! Amazing TR so far, also waiting for pics here of everything! +1 Can't wait for the pics!